Don't let the word “horsefly” fool you. Cattle, dogs and even humans can be on the receiving end of a female horsefly's painful bite. The horsefly (genus Tabanus) makes a cut in the skin with its razor-sharp mouth parts, then feeds on the blood. 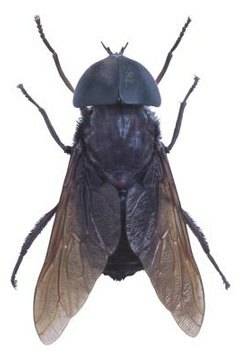 A component of the horsefly's saliva acts as an anti-clotting agent, allowing the fly to feed rapidly on the blood of his warm-blooded hosts. The large, heavy-bodied horsefly is attracted to marshy areas and damp, low-lying meadows for breeding. The flies lay their eggs in masses on leaves or other vegetation that overhang water. When the eggs hatch, the larvae are able to burrow down into the soft, moist soil, where they feed on organic debris, snails and other insects. Because the larvae require moist soil to survive, the horsefly has a specific preference for breeding grounds. While you may be able drain puddles and low spots where moisture develops, it isn't practical or environmentally feasible to drain swamps, bogs and other wetlands. This means there is little you can do to minimize this attraction if you live near a wet area. Horseflies prefer hot, sunny weather with not much of a breeze. While there is little you can do to control the weather, you can minimize your and your animal's exposure to these sizable insects, which can reach 1 inch long, by planning outside time in the morning or evening and on days with a steady breeze. Horseflies also tend to stay out of the shade, so locating horseback riding, grilling and other outdoor activities in shaded areas can provide relief. Like many creatures, horseflies find prey visually. They are attracted to motion, shiny surfaces and dark shapes. If you find yourself outside during a time when horseflies are bad, you can get some relief by changing into light-colored clothing. Horseflies often congregate around swimming pools, harassing the swimmers. This is due to the motion of the swimmers splashing around in the pool and the shiny, reflective surface of the water. Horseflies don't need to see their prey to find it. They are attracted to carbon dioxide, which animals and humans produce naturally as part of the breathing process, and warmth, another byproduct of everyday living. There is nothing you can do to turn off these mechanisms that attract horseflies. On the other hand, you can find some relief in the fact that horsefly season is typically very short, these pests are only a nuisance for several weeks, late in the summer.